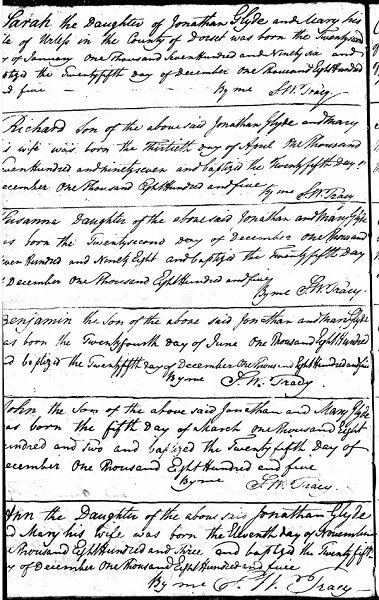 Jonathan Hooper Glyde, was probably the son of James and Hannah Glyde whose baptism was recorded in the Nonconformist Register at Exeter on 2 March 1772. He married Mary Chaffey of Winsham (the Chaffey name appears later as second forenames) and they were to have at least six children; Sarah (b 1796), Richard (b 1797), Susanna (b 1798), Benjamin (b 1800), John (b 5 March 1800) and Ann (b 1803). All the children were baptised at Yeovil on Christmas Day 1805 and their baptisms are recorded in the Yeovil Independent Church Register of Baptisms. In this register Jonathan and Mary were described as being "of Urless, Dorset". Urless is on Toller Down, to the south of Yeovil, between Winyard's Gap and Maiden Newton. As all six children were baptised in Yeovil on the same day this is usually either the sign of newly-converted Nonconformist parents or Nonconformist parents who have just moved to a location close to a Nonconformist chapel. This presents something of a quandary therefore, since it is known that the Glydes were already a Nonconformist family (at Exeter) why didn't they have their children baptised there? If they had already moved from Exeter, where had they moved to? If the children were all born at Urless why weren't they baptised individually? I tend to surmise therefore that the children weren't born at Exeter but possibly near Winsham (their mother's place of origin) and the family then moved to Urless between the birth of Ann in 1803 and the date of the collective baptism in 1805. I also reason that Jonathan and Mary moved to Preston Plucknett when the children were very young, hence when their son John gave his place of birth as Preston in the 1851 census as it was simply because he grew up there from an early age and just didn't remember Urless. In any event John Glyde was born in 1802 and certainly spent part of his childhood at Preston Plucknett, Yeovil and eventually became a linen draper. In Pigot's Directory of 1824 John Glyde had two listings, as a linen draper and as a grocer in the Borough. 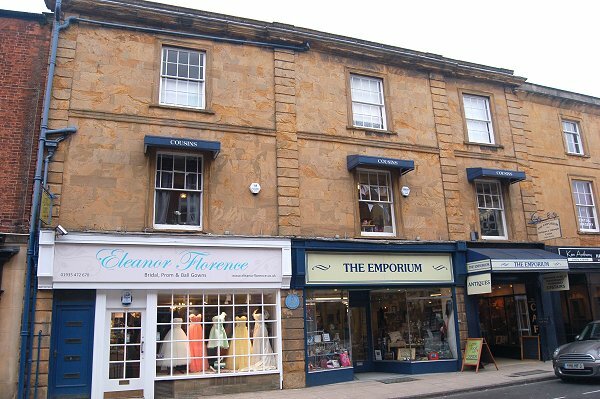 On 27 October 1825, at Frome, Somerset, he married Susan Gerard of Frome. They were to have at least four children all born in Stalbridge, Dorset, and all four having their baptisms recorded in the Stalbridge Nonconformist's Register of Births. The children were John (born 1 November 1827), William (born 24 September 1826), Susan (born 17 July 1829) and Mary Chaffey (born 18 October 1831). John was listed as a grocer of the Borough in the Jury List of 1827 but by 1830 he had formed a partnership and Pigot's Directory of 1830 listed Glyde & Davey as wine & spirits merchants of the Borough. Glyde & Davey were mentioned frequently in the Churchwardens' Accounts of St John's church between 1831 and 1839 as grocers supplying provisions to the church, usually for the perambulation of the parish boundaries. Indeed, John served as the Vicar's Churchwarden himself in 1865. E Watts' map of 1831 shows that he had bought the large field called Mill Close, previously owned by James Cayme the Elder, lying to the south of Mill Lane. The 1841 census listed John and Susan, together with John Jnr (portrait c1840 at left) and William, a Draper's assistant and a female domestic servant living in High Street. John listed his occupation as a Linen Draper. By the time of the 1851 census John had clearly made his fortune and had moved his family to Princes Street and was now living in Wyndham House with Susan and their two sons, together with a cook, housemaid and groom. John Snr listed his occupation simply as a 'Landed Proprietor' while both the sons, John Jnr and William, aged 24 and 23 respectively, were both listed as Solicitors. Around 1860 John Snr and Susan moved to Martock, where John died in December 1863, aged 61. John Jnr continued to live at Wyndham House. John Jnr and his older brother William were in partnership and Slater's Directory of 1852 listed John & William Glyde, Attorneys of Princes Street. They were also listed as agents for the Sovereign Life Insurance Company, the Phoenix Fire Insurance Company and the National Guardian Fire & Life insurance Company. However, as outlined by the notice placed in the London Gazette in 1855, the partnership between John and William was dissolved by mutual consent, with John to carry on in his own name as a solicitor in Princes Street. William, after the partnership was dissolved, moved to Portishead, Bristol. He married Julia Jessop (1831-1903) on 14 October 1858 at Emmanuel Church, Weston super Mare. She was the youngest daughter of Edward Jessop Esq of Weston super Mare. William and Julia had two sons; William Henry Jessop (1859-1892) and John Chaffey (1860-1935), both born at Portishead. William Glyde was listed as a Solicitor of Princes Street in the 1875 edition of the Post Office Directory and since his brother John had died in 1866, I assume William continued the Princes Street law firm in his own right. Although he continued to live at Portishead he was rather less active from his offices at 16 John Street, Bristol. In November 1870 he was an attorney in Bristol for Thomas Locock of Portishead, Somerset, "beer and wine retailer and carpenter". He was, however, very active from his offices in Wyndham House, Princes Street, Yeovil, in 1875. In March he was attorney for Simeon Pitman of Yeovil, glovebox manufacturer; then George Thomas Harvey of Yeovil, brickmaker. In June he was acting for Walter Harrison of Yeovil, plasterer and beerhouse keeper. John Jnr, in the meantime, had married Ellanette Richards in 1856 at Islington, London. She was the daughter of Thomas and Jane Richards of Stapleton Manor, Martock. John Jnr and Ellanette were to have three daughters; Rosa Richards (1857-1866), Ella Mary Gervis (1858-1960) and Netta Gertrude Sutton (1862-1953). Thomas Richards of Stapleton Manor, Martock, (d 1827) left his half of the Stapleton Estate equally between his sons William (d 1835) and Thomas Jnr (d 1866). The lands were partitioned in 1857, Thomas Jnr's daughter Ellanette, wife of John Glyde of Yeovil, receiving 159 acres and Thomas Jnr's son, also Thomas, receiving 185 acres including Stapleton Mead Farm. The estate continued relatively intact until 1868 when the two surviving Glyde daughters, Ella and Netta, sold off most of their share. 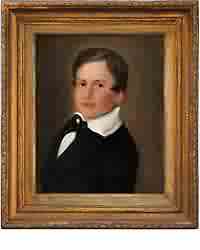 John's wife, Ellanette, died at Lyme Regis in 1864, aged just 33, and John and Ellanette's daughter Rosa died in 1866. The Post Office Directory of 1866 listed John Glyde as a Solicitor of Princes Street but in November 1866 he too died, at Yeovil. The surviving daughters, Ella and Netta (clearly named as a pun on their mother's name), went to live with their grandmother, Susan, at Martock. Ella married Whitfield Scammell on 11 May 1882 in All Saints, Martock (see footnote below). They then lived at The Elms, Stapleton, Martock. Her grandmother Susan died at Martock in the spring of the following year, aged 82. On Tuesday the streets of Martock presented quite a holiday appearance on the occasion of the marriage of Miss Glyde. eldest daughter of the late Mr John Glyde of Yeovil, with Mr Whitfield Scammell of Southhill Park, Hampstead. 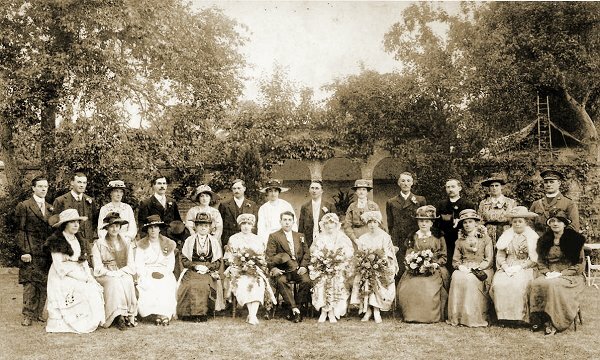 The bride was attended by 4 bridesmaids, Miss Netta Glyde sister of the bride, Miss Scammell, sister of the bridegroom and the Misses Reynolds and Wilkinson cousins of the bride and bridegroom. The grooms men were Mr Leonard Scammell, Mr John and Edwin Glyde and Mr Reynolds. The bride was attired in ivory brocade and satin, trimmed with Spanish lace wreath, and veil. She also wore a diamond brooch and earrings the gift of the bridegroom and carried a magnificent bouquet. The bridesmaids were dressed in pale blue sateen, trimmed with cream lace, straw hats trimmed with pale blue feathers and cream shoes to match. Each bridesmaid wore a gold bracelet, the gift of the bridegroom. The wedding presents were numerous and costly. 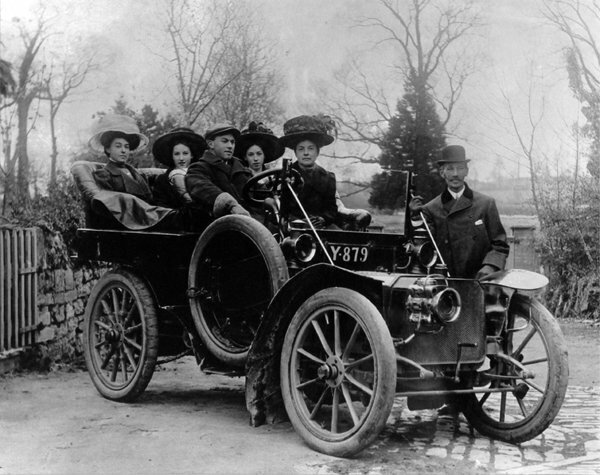 The parties drove to the church in three carriages with postilions and two private carriages. There was a display of flags and arches. Two good specimens of the latter had been erected at Stapleton which said "Long Live the Bride and Groom". The path leading to the porch and the aisle were carpeted throughout, the bride being very highly respected. On the arrival of the bride the choir sang "The Voice that breathed o'er Eden". The Vicar, Preb Salmon, conducted the service and the bride was given away by her cousin Mr Thomas Richards. The bells gave out a merry peal. Rice was showered upon the bride. The party drove off to Stapleton, salutes of small artillery greeted them on the way. In the afternoon the happy pair left Stapleton en-route for the Isle of Wight. The Yeovil Tithe Apportionment of 1846 shows that John Glyde had extensive land holdings in Yeovil as tabulated below. His total acreage held in Yeovil was 94a 0r 28p. 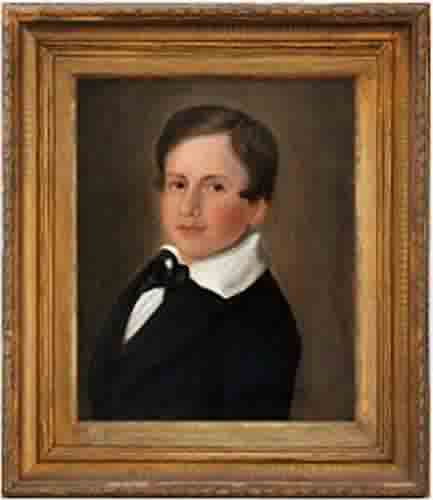 A portrait of John Glyde Jnr of around 1840 when he was 14 or 15 years old. Wyndham House, Princes Street, home of both John Glyde Snr and John Glyde Jnr, with its blue plaque. Now, sadly, split into three premises with an appallingly unsympathetic ground floor elevation, inexcusably removed glazing bars to the first floor windows and the awful little demi-shades to the first floor windows - some people, it appears, simply have no architectural appreciation whatsoever. At least the Regency-style 'marginal lights' remain intact on the second floor. Photographed in 2013. The page from the Yeovil Nonconformist's Register of Births showing the baptisms of the six children of Jonathan and Mary Glyde - all on Christmas Day, 1805. This photograph dates to around 1910. In the front passenger seat is Ella Scammell (Glyde) with Arthur Scammell in the driving seat. From left to right seated at the rear are Ellanette, Dorothy and Elsie Scammell. Standing is Whitfield Scammell. Wedding of Dorothy Frances Scammell to Thomas Taylor in 1919. Taken at “Elmleigh”, Stapleton, Martock. 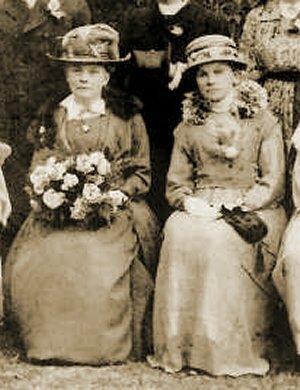 Ella and Netta are seated to the right of the bride and bridesmaid and are enlarged in the photo below. Ella and Netta in 1919, enlarged from the previous photograph. By this time both sisters had married into the Scammell family.